Finding Me by Kathryn Cushman is a contemporary novel from Bethany House about a woman who discovers that the life she thought was hers has actually been a lie. As she uncovers the truth about her life, her life is forever changed. This novel begins when Kelli Huddleson loses her job for being an honest person who tries to help someone. She uses this time to try to reconstruct her past, because her parents had been killed in an accident and left her with many debts to handle. While cleaning out the homeplace, she finds clues and begins a journey to discover who she really is. There are many twists and turns as Kelli uncovers her past and plans for her future. I thoroughly enjoyed this book and its many twists and turns. I especially enjoyed the way family love is stressed and how faith plays such an important role in life. I would recommend this to anyone wishing a good Christian novel with a little suspense. 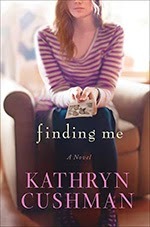 The publisher provided a review copy of Finding Me.